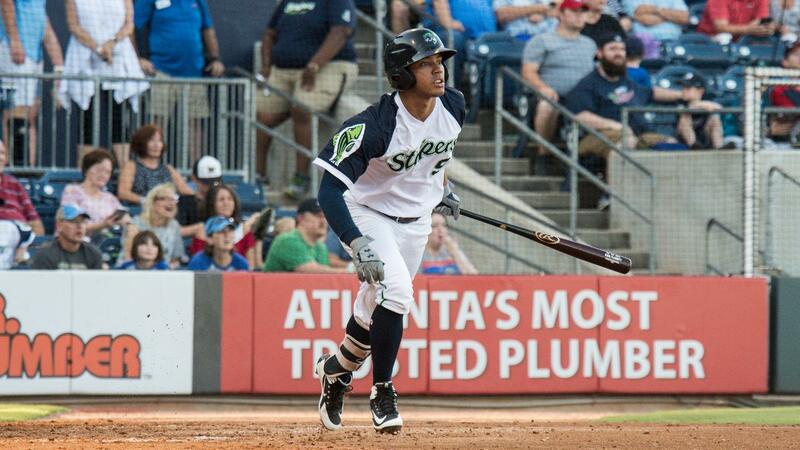 LAWRENCEVILLE, Ga. - Shortstop Luis Marte's two-run single in the fifth inning was the deciding factor in the Gwinnett Stripers' 2-1 win over the Charlotte Knights Saturday at Coolray Field. Marte stepped up with two outs and the bases loaded against left-hander Colton Turner. With two strikes, he grounded a pitch through the shortstop hole, scoring Phil Gosselin and Xavier Avery as the winning runs. The Stripers had been held to one hit and a walk to that point against Turner. Gosselin reached on a double, Avery singled and Alex Jackson walked to load the bases before Marte's hit. The Knights held a 1-0 entering the bottom of the fifth. Dustin Garneau led off the third with a single and later scored on a Ryan Cordell single against righty Wes Parsons. Charlotte had a chance to tie the game in the sixth when Parsons walked Eloy Jimenez and Matt Skole singled. Parsons then threw a wild pitch, putting both runners in scoring position with one out. But Parsons induced a soft grounder from Seby Zavala to Marte, who fired home to catch Jimenez at the plate before he could score. Jake Elmore flew out to end the threat. Parsons (W, 7-4) was economical over 6.0 innings of work, allowing just four hits and the lone run with a walk and two strikeouts. Chase Whitley (H, 2) worked 1.2 innings with a walk and a strikeout. Adam McCreery (H, 1) struck out Skole as the only batter he faced. Jacob Webb (S, 11) pitched a perfect ninth, fanning Bryant Flete to end the game. Turner (L, 0-2) went 5.0 innings, allowing four hits, two runs and two walks with four strikeouts. Carson Fulmer threw 2.0 scoreless innings in relief, and Brandon Brennan struck out two in 1.0 inning. Avery was 1-for-2 with a walk and a run scored for Gwinnett. Garneau went 1-for-3 with a run scored for Charlotte. The Stripers (69-68) and Knights (63-74) square off again Sunday at 1:05 p.m. from Coolray Field. Right-hander Jeremy Walker is set to make his Triple-A debut for the Stripers against Knights' right-hander and Cleveland, Georgia native Spencer Adams (4-6, 3.35 ERA). Tony Schiavone will have the play-by-play call on 97.7 and 93.5 FM "The Other Side of the River" beginning at 12:35 p.m.